During the past few years, mortgage interest rates have continued to flirt with historic lows and the experts don't see these changing dramatically in the near future. It appears that loans at rates hovering around the 4% mark, or even lower, should be available for at least the short term. So that begs the question: If you haven’t refinanced your mortgage yet, why not? The answer is that there’s more to refinancing than just low interest rates. Deciding whether to refinance is all about finding your break-even point—the time when you’ll actually begin to save money after taking into account all relevant factors, including tax ramifications, the fees you pay to refinance, and the difference in monthly mortgage payments. 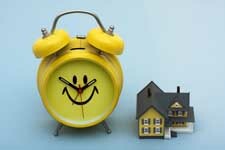 If you’ll hit the break-even mark during the time you expect to be in your home, refinancing probably makes sense. How do you determine the break-even point? Online calculators are plentiful, but some may leave out crucial factors. To make sure you’re taking everything into account, do your own arithmetic using these five steps. 1. Add up the refinancing expenses. This may include fees for attorneys, loan application and origination, home appraisal and inspection, deed recording, title insurance, credit reports, and any “points” you pay to obtain a favorable rate. 2. Find your monthly savings amount. Simply subtract your current monthly payment from the amount you’ll owe if you refinance. 3. Calculate the tax cost of refinancing by multiplying the monthly savings amount by your combined federal and state income tax rate. Generally, mortgage interest is deductible on your federal return, so if your interest costs drop, so will your deduction. 4. Subtract the tax cost from the monthly savings amount. That will give you your net monthly savings. 5. Divide the cost of refinancing by the net savings to find the number of months it will take to pay off the refinancing expenses. This is your break-even point. For example, if your cost is $5,000 and your net savings is $1,000, it will take only five months to break even. Unless you’re planning an immediate move, refinancing makes sense. However, if your cost is $10,000 and your monthly savings is only $250, it will take 40 months—more than three years—for refinancing to pay off. That may be a tougher call. If you have questions about whether it’s finally time to refinance, we can help you crunch the numbers and consider the impact of such a move on your overall financial situation. Do You Have An Administrative Trustee?